This clear color gandalf style sherlock pipe measures around 8" in length. The glass bowl is large with rasta colored stripes wrapped around it. The color changing gandalf has a gold hue to it as well as light color stripes to make it a very attractive pipe. Two small clear feet keep this gandalf glass piece upright to keep your smoke blend inside the bowl. 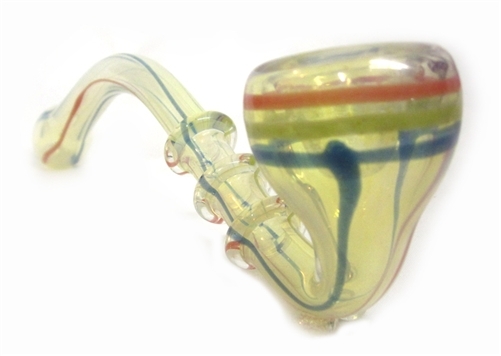 This super sized glass pipe weighs approximately 2.5 oz (70 grams). All of our wholesale glass pipes are hand made and may vary slightly in size, weight, and style.